What are the major complaints I get from readers of this blog? One: they can’t find many of the Chinese wines that receive praise in contests and from critics. Two: those they do tend to find are dishearteningly expensive. This goes for wine buyers in hotels, restaurants and bars, too, who tell me of their difficulty sourcing good Chinese wines at good prices. Look, we know China can produce good wine. We knew it a century ago when Changyu wines from Shandong won international accolades. We knew it 25 years ago when wines from fellow Shandong winery Huadong did the same. And we know it now more than ever via the growing number of good wines made throughout the country, an outcome that makes sense given China’s diversity and the current state of wine-making technology. What we need now is not just good wine but good-value wine that is made in larger amounts and easier to find. Given this, my focus over the past eighteen months has been on wines that fit what I call a “Triple-A” or “3A” formula — appetizing, affordable and available. I focus on select labels from producers like Grace from Shanxi, Hansen from Inner Mongolia, Great River Hill from Shandong. and 1421 from Xinjiang. The goal is to use wines that are enjoyed by consumers (appetizing), have labels that sell for less than rmb150 or, ideally, less than rmb100 (affordable), and are available via retail chains or distributors with nationwide reach (accessible). 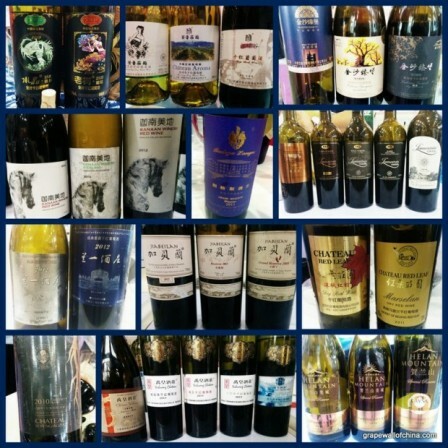 I used Triple-A wines in April’s China Wine Tour and December’s Grape Wall Challenge, and use them in tastings with fellow consumers and trade people. I also use more expensive wines, such as those from Helan Qing Xue and Silver Heights (both from Ningxia), but usually for hotel and restaurant buyers creating a China wine list that already has Triple-A options or for people yet to try Chinese wines and interested in what is available. Does all this mean I wouldn’t appreciate yet another Cabernet blend that tastes good, costs over rmb1000, and has a small production run and no distributor? Of course not. Drinking any wine — especially any good wine — is fun. But consumers here also deserves good wines that are inexpensive, that have larger production runs and decent distribution, and — given the increasing knowledge of buyers and the often negative attitudes they have about local goods — that are backed with savvy marketing. The kind to compete with good cheap wines from Spain and Australia and Argentina and Chile and elsewhere and that are increasingly popular here. It won’t be easy. Few producers can make enough wine of any quality, let alone good quality, to cover a market with a billion-plus people armed with growing disposable income. And while there are dozens of producers making good wine, in many cases that means only a few thousand bottles per label. (I regularly describe them as representing a case or two out of the barrel of total production). Getting wine to consumers is also a major challenge for many smaller players, although we do find success stories, and the rise of online sales is fortuitous. The situation might sound a bit dire but this is a good time for China to make a quality leap. The government’s austerity program has severely slashed luxury goods spending by officials over the past two years, including on expensive wines, and it appears here to stay. That means producers need to appeal to regular consumers, who are learning more about wine and increasingly looking for quality and value. Given the current lull in overall demand as the market recovers from slashed spending by officials, and a large number of vineyards now coming online due to past investments, we should see grape surpluses over the next few years. That will hopefully mean both price and source stability for producers. And that lowered risk, combined with the growing skill of the country’s wine makers and the need to appeal to general consumers, makes the time ripe for creating more triple-A wines. Note: I’m a fan of the country’s boutique wineries but production of, say, 5,000 bottles translates to one bottle per ~200,000 consumers. If consumers really are increasingly buying wine based on taste rather simply for gift-giving or expressing status, China needs larger quantities of good wine, whether that come from the big brands boosting quality, current small operations expanding or new players entering the market. By the way, here are some Chinese wines I tried at the Yanqing Wine Expo earlier this week. I’ll have more on them and the wine fair soon.